TABASCO® brand Sriracha Sauce --- 1-1/2 Tbsp. 6-inch corn tortillas --- 4 ea. In a small bowl, mix TABASCO® Sriracha Sauce, ranch dressing and lime juice; set aside. In a pan over medium-high heat, warm tortillas; set aside. In a medium pan over high heat, bring oil to its smoke point. Using tongs, gently place tilapia slices into pan. Allow fish to fully caramelize before turning over. Adjust heat if fish begins to turn too dark on the sides. Layer each warm tortilla with red cabbage, corn and cotija cheese. 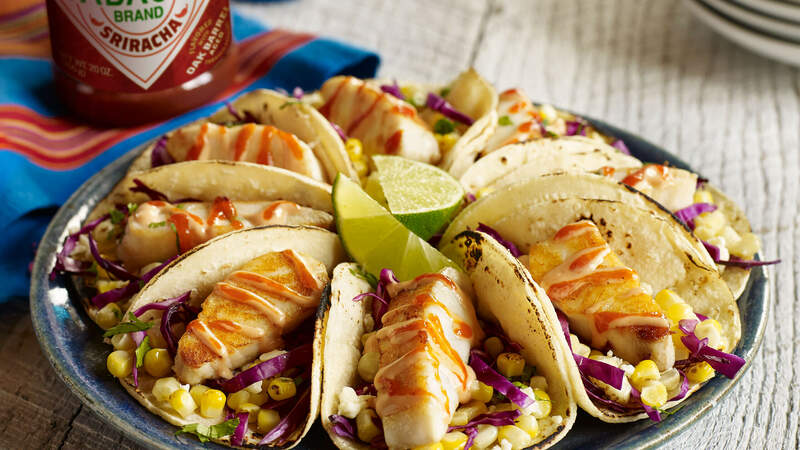 Place equal portions of tilapia atop each taco. Drizzle tacos with Sriracha-lime ranch sauce and serve.